There is no question what my favorite city in England is. 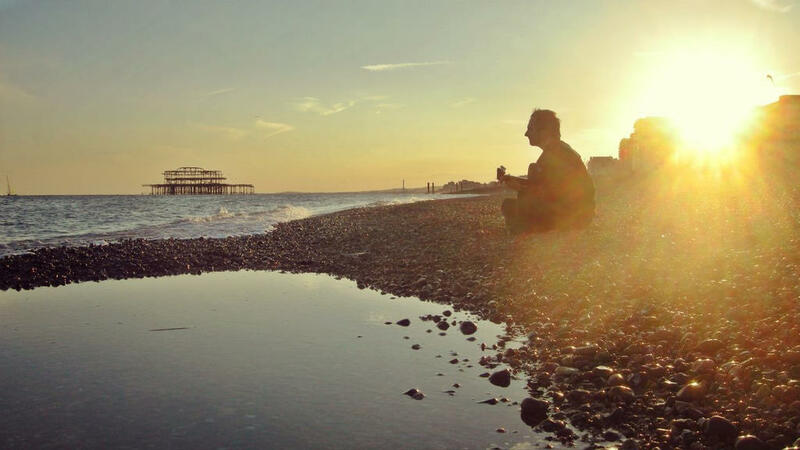 Brighton is the city of life, spark, soul, music and atmosphere and if me and my boyfriend lived any bit closer, we’d probably spend every weekend there. We keep dreaming of living there one day, even ‚though the cost of it is quite high, because we always have stuff do to there, we keep coming back and we just know that even after so many times we still don’t know half of it. But I thought I could put down at least the bit that we know of, it’s still a lot of great shops and places and if you are looking for some tips or wondering if the city is worth the visit, well here you go and I hope this helps. 1) Churchill Square shopping centre – Churchill Sq. is generally a cool start and a meeting point. While walking Church Road from Hove you will already pass many shops and restaurants but only around the Churchill Sq. you have reached the centre of all fun. Right in the centre you will find probably the best local free public toilets. They are the biggest, cleanest and most comfortable. Then there’s Claire’s, CDs, posters and gadgets in HMV or Menkind, and few fast foods upstairs from which there is one to mention – Ed’s Easy Diner. The food is quite tasty, well, it’s american style, so can be a tad oilier and heavier than we’re used to now, and the music can be pretty loud but I guess the atmosphere and overall experience is still worth it and the best thing is their shakes and a smartphone app that gives a lot of discounts, offers and benefits including a birthday treat. But if you’re not into that, don’t worry, on your way down along the North Road you’ll find plenty of places to eat at. And just before you go, you’re likely to see some buskers in front of the shopping centre, especially on a nice day. But this is by far not the only spot to see them, after all that’s one of the main things Brighton is about. It’s a nice thing to have a snack or coffee there and sit around while someone plays for you – and there are few nice stalls like Falafel King and others to help you with just that. 4) All you can eat’s, burgers, traditional english breakfast… – if you didn’t come to England to eat the same things that you can eat everywhere else, I’d mention couple of All you can eat’s on the North Street, they have italian, indian or mixed sortiment for a great price (especially if you eat a lot :D). Just keep in mind that workdays are cheaper than weekends. One of these is Casa Della Pizza that we personally tried. TBH we were kinda lured in by an offer of a free drink but we were always peaking through the window, wondering that we should try this if just for the experience. So the outcome? The food for 7 pounds each was decent, not the best and not the worst. We stuffed ourselves like pigs and didn’t even have to have supper. If that’s the sort of experience that you’d like to try, well here you go 😀 If you consider that in a regular pub you would eat for cca 12 pounds pp, it’s definitely a bargain and a great option for someone who travels on budget. I’d like to mention The Post and Telegraph pub, where you can have a really delicious traditional English breakfast and that even in vegetarian version with Quorn sausages. I know they have also burgers, steaks and other things but those we haven’t tried. Just a great place to soak up some traditional english atmosphere and eat well. Just remember, like in most pubs, you need to place your order at the bar, tell them your table number, pay there and than it will be delivered to your table. 5) Efes Kebab and Kokoro – speaking of food, I also want to mention Efes Kebab, where you can get a doner plate for some 6 pounds, it’s really good and again easily shareable between two people. Interior here is not so great, but the food is good, hot and we had it many many times, as well as our friends, it’s been our favorite place for a long while and in spite of the fact that most places like this make me nervous (as for hygiene), here I know there’s nothing to worry about. Points also go to are newly discovered place called Kokoro, which is a cool little sushi place with other things too, like spicy sweet and sour tofu with rice. This is a great stuff for people who don’t mind spicy 😀 For the other kind I’d suggest some Aloe drink (but I’d get that in Poundland, not in Kokoro – in Pound you can get two bottles for one pound). Again, you can share and it’s a nice option for those who like something meatless. 7) Krispy Kreme – we can only recommend these delicious fluffy donuts, smooth and light as a cloud. They have a couple of tables to sit at with coffee or why not take them away and eat out on a nice day? Perhaps in the Royal Pavillion Gardens…? 8) Sainsbury’s – As much as I adore Krispy Kreme, we are obsessed with finding the best food you can have for the smallest price. And in that area our winner has for years been the pack of five raspberry jam donuts from Sainsbury’s. Of course there are other options like chocolate or regular custard but these are our favorites when it comes to jam donuts. They are different to Krispy Kremes but delightful in their own way, but they need to be fresh, otherwise they get hard and then it’s not so great. Sainsbury’s can be found on top of the street but also down near the Brighton Pier. 9) Waterstones – bookaholics will probably appreciate Waterstones. Apart from books they have some really nice gifts to buy like diaries, notepads but also some geeky stuff. They even have their own coffee shop on the top floor but to be honest, the prices never got me intrigued. 10) Tiger – if you don’t know already, Tiger is this special danish shop that can be described as stationery, wooden toys, a bit of home decor and all kinds of gadgets with style. It reminds me of Ikea and they often change their sortiment so I like to go there quite often to check what new stuff they have. I bought some travel gadgets like a foldable hairbrush or small hair dryer there, and as a stationery geek I always love to look at their notepads, especially those tiny one from bamboo. An extra point from us as expats is for their herbs. For some reason it’s quite difficult to get herbs in bigger packs in UK and Tiger is one of the few places where you can. 11) Lush – this is probably no news for you and if it is, don’t miss a chance to go tu Lush at least for the explosion of lovely bathbombs smells that the shop is filled with. Lush is one of the best places to get presents, I always shop there before Christmas and birthdays and I myself have tried a ton of their products and I am still obsessed with their shampoo bars which are just an absolute win for travelling people – but not just us. Lush smells good, doesn’t test on animals, uses pretty much only natural ingredients, everything is handmade and if possible, vegan and cruelty free, they also have a nice policy about packaging – their products come either naked or in their own pots that you can return and they will use them again. It’s also a place to have a look at nice quirky girls with tattoos, coloured hair etc..
12) Poundworld and 99p store – who loves to save money, loves Pound shops. You can get all kinds of cosmetics, drugstore goods, medicines, trinkets and home decor, stationery, electronics, party decorations, even food and drinks for just one pound. If you don’t need anything else, get at least a bag of nuts because as you will see bellow, in Brighton you have a good chance of feeding some squirells and when you spot them, you don’t want to be food-less. 13) Superdrug – it’s not that I am crazy about drug stores, but… well, I kinda am. I don’t buy stuff there very often but usually when I’m in the town wandering about shops, I like to look and smell nice, so sometimes I go there just for the testers, I spray myself with some expensive fragrance and maybe put some colour to my lips, just to feel a little bit nicer. You’d be surprised how much better can your day instantly get just because of such tiny detail. And also your selfies. 14) Lanes – famous little streets full of little shops, where you can feel quite like in the Diagon Alley, especially because the entrance to some of these is quite invisible unless you „know where to look“. They are cool to explore and if you are a wizzard, you can have all the more fun. I swear, once I found a sweet shop that looks pretty much like Honedukes. Potterheads united! 15) Markets and shops – left of the North Street (so streets like Windsor, Portland, Bond) is a place to see a lot of markets on a good weather, and quirky shops on any day. Shop for gifts, eat in some of the restaurants or listen to buskers. 16) GAK – musicians shouldn’t miss the very known GAK shop with guitars, amps and keyboards (hence GAK). You’ll find it on the end of these streets and it’s easy to spot as it’s a big building with bright yellow and red colours and a guitar over it. 17) Infinity Foods – just across the street lies this shop with a broad offer of organic and „true“ foods and cosmetics. Something for vegetarians, vegans and others. 18) Royal Pavillion gardens – without a doubt one of the best places to have a picnic, to sit down on the grass and to listen to buskers. The Pavillion itself is very nice and instagramable but what always brings us back are the squirells. There are not that many and sometimes we don’t see any, but usually we do have luck and they are used to being fed by people so they come pretty close. So get some nuts or oats, walk around and you’ll see for yourself. 19) Brighton Pier – when you won’t know what to do with your coins, have fun with them in the Pier. 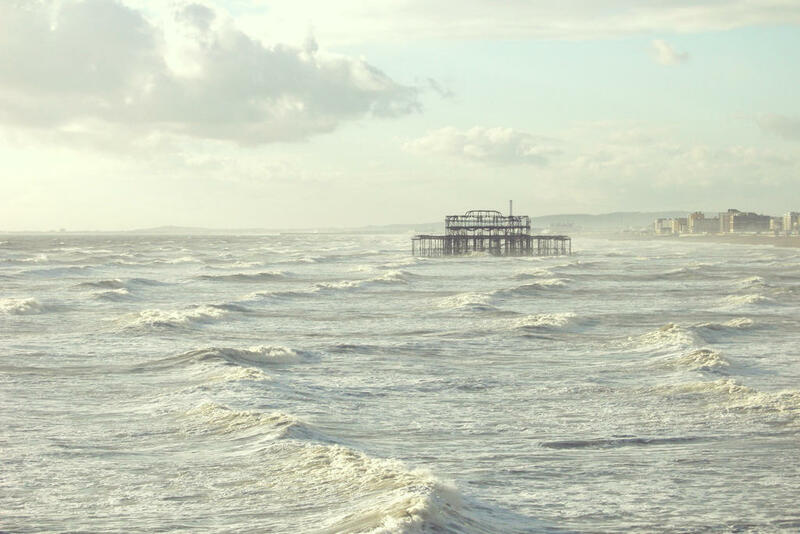 Apart from the great views of the Brighton seaside, there is a casino where you can try to score some trinkets like keyrings or badges, or some stuffed toys, and on the very end of the Pier there are some carousels and other attractions, fun way to spend some time on a nice weather. If you don’t have coins, there are changing machines, or you can just walk around without spending. With waves crushing loudly somewhere under your feet it’s a must-visit to get some fresh sea breeze into your lungs. During the season there are folding chairs that are free for use. Just grab one and relax in the sun. How epic is that! Pier also has some food stalls to offer but mostly it’s fried oily stuff like Fish’n’Chips, donuts or cotton candy. We had some fishcakes in the pub on the actual Pier and it didn’t taste much like fish, but they did have an enormous portion of chips, that I’d give them. 20) Brighton Wheel Brighton ZipWire – for some reason, the iconic Brighton Wheel was taken down but don’t pull your hair yet, there are other ways to enjoy the view from above. In the place of the former wheel they build a ZipWire tower where you can slide across a long wire to really get some fresh air in your lungs and have a fun experience. We personally haven’t tried that yet, sadly I don’t even have a picture of the tower yet (looser, I know), and 22 pounds sounds like quite a lot but I think maybe, just maybe we’re gonna try it one day anyway because it looks fun and it never hurts to try something different occasionaly. 21) British Airways observatory – another way to look over Brighton (and definitely a higher one, I think it’s the tallest building in East Sussex) is this 360 degree observatory where tickets go for like 16pounds and it basically takes you up like an elevator so no climbing. 22) Brighton Beach Promenade – any decent weather, hell, even not decent, the best thing in Brighton is probably its long and lively Promenade. There can be buskers, shops, restaurants, markets, carousels, live music, or just people having a stroll, walking their dogs, running and enjoying the seaside, and you always get plenty seagulls, waves and fresh air. What better way to enjoy a city on the edge of the land anyway? We especially love it in the sunset, we always return through here to our parking spot. It’s not much for swimming, though, unless you are quite cold resistant or equipped with a wetsuit, but sometimes you do see people doing that, or surfing, even though it’s probably not the best place for that, I think the waves get big only on really windy, rainy days. But sometimes it works. You can also collect some pebbles as souvenirs, or have a BBQ at marked areas. On the level of First Avenue there are also some free public toilets. Not the cleanest ones but when you gotta go… And if you did consider going for a swim, just next to the toilets there is an outside shower. 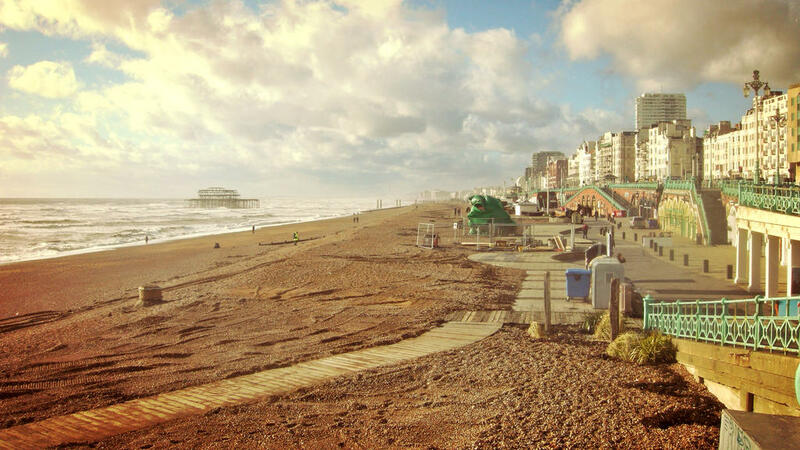 23) Events – don’t ever doubt that Brighton lives. At any moment, especially during season, you can see all kinds of event, music festivals, food festival, street food markets, gigs, gay parades, marathons, whatever. So before you go, be sure to check online what’s on, so you don’t miss it. 24) Sea life Brighton – My boyfriend went there and wasn’t overly excited but who knows, you might like it and it could be something to do with kids. 25) Phoenix Rise street! – last year I was looking into some free parking overnight and a discussion on Couchsurfing revealed that there is actually a street called Phoenix Rise, which is a name of my blog and therefore it gave me a bit of hiccups 😀 So of course I HAD to go there at some point. It’s located some 15 minutes away from Pier, it’s not much but hey, it’s something to do for fun. 27) Job Centre Plus – ok, this is only interesting to expats like myself who come to work in UK, but to make the list as complete as I can, I mention it too. We were happy to find out that it’s there, we got our National Insurance Numbers there and then had the rest of the day to enjoy Brighton. 28) Brighton Marina – this part we haven’t explored much yet but I know there is Asda, a cinema and some shops and places to eat. It’s something I want to explore a bit more the next time I can. And what else to do while you are around? 29) Seven Sisters cliffs – when you are headed near Brighton, you absolutely should involve this in your trip. The best time is sunrise or sunset but this iconic landmark will be great on any time. These cliffs are famous as hell, you might know them from plenty of romantic movies and they are like an hour away by car. If you don’t have a car, I think there is some bus going there too but not sure what times etc., you’ll need to check that. Bring sunglasses because especially in sunny weather the white just burns your eyes, and also bring some windproof clothes because it’s windy in any weather. Have some coins ready for the parking machines and note that there are few of them and for each you should basically have an extra parking ticket, so plan your walk accordingly, if you want to have a bit of walk at one place and then move with car to another further one. 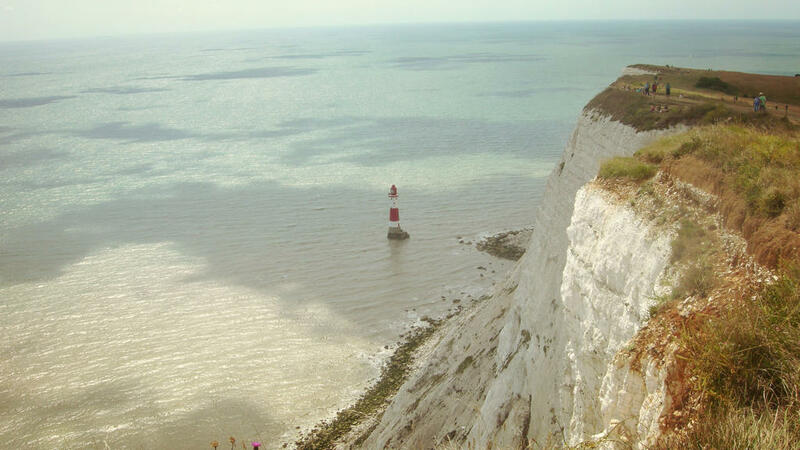 Don’t miss the famous Beachy Head lighthouse and when you want to eat, there is a pub of the same name or a café in Birling Gap where there are also some free public toilets. I just have one note to say about the pub, we once had some burgers there and it was great but later I discovered they are (according to many comments online) very unfriendly to dogs, even if you make a booking ahead and ask about it and your dog is tiny and behaving. So if you travel with dogs, I’d suggest to plan your meal elsewhere. 30) Other cities nearby – there is Worthing, where I know at least one great thai restaurant Thai Street Food, some shopping street, Poundland etc., and there is Shoreham-by-Sea, where you can watch a lot of boats and there is a nice pub called Bridge which has an outside terrace with an overview of the bay, but that’s pretty much all that I know 😀 You’ll have to explore that by yourself. If you know ahead, you can definitely try Couchsurfing. There are quite a lot of hosts, you just need to search for them in advance so that they don’t have plans already or other guests. Especially when it comes to Christmas and alike, you’ll find out that two weeks ahead might not be enough. Benefits of Couchsurfing? You don’t pay, at least not with the money. It’s customary to bring some treats however, wine, something from your country, or to cook a meal for your hosts. It’s also expected that you’ll spend some time with them, talking and exchanging experiences and stories. This option is often searched by people who want to stay somewhere for free, but that’s not what CS is really about, the major point is to meet the locals and spend time with them, get their perspective of the location and maybe their tips on where to go. It’s not like get the keys and bye, see you in the morning – or not, if we leave early. CS is not a hotel-like experience, it’s more like meet new friends. So if you are not into that, especially if you don’t have much time and want to use all of it for the location itself and not much for people, I’d simply look into AirBnB or Booking.com, but be aware that Brighton is pricey. Sometimes even more than London. So if you want to go cheap, you’ll probably have to deal with the shared bedroom in a hostel that comes with the risk of people being noisy, snoring etc., and also you give up some comfort and privacy. I’d always look at the ratings and comments, especially as for hygiene and service overall. Lots of these hostels offer breakfast but don’t think like traditional english, it’s much more like a piece of toas and jam, sometimes tea/coffee or juice. You can definitely have a look at Ymca and Yha, we have the best experience with Yha in Penzance, clean, nice, lovely people and the best english breakfast with a bufet (croissants, juice, coffee, cereals, fruit…) but I haven’t found the option to get a room in Brighton. Wherever you go, I suggest to have a look at Parkopedia, that’s simply a great site with all the info you need, but when we go to Brighton, we always park on Norton Road in Hove. In the evenings after 8pm there are lots of spots on streets where you can park for free but to find a spot might be challenge. If you come for a short period of time, there’s always Tesco, but Norton Road is great and cheap and I wouldn’t risk getting a fine, they can be painfully big. Norton Road to Churchill sq. is like half an hour of walking or you can catch a bus for like 2.20 per person and be there in few minutes. I’ve mentioned Starbucks, Ed’s Easy Diner and Burger King, but these are not the only apps you can use in the city. Lots of shops offer some benefits, just try have a look. I am subscribed to Krispy Kreme and get offers quite often, even though they are usually for weekdays and I only come at weekends. I also have offline maps, Paperchase app, some Citymappers (the London one is great, although it unfortunatelly doesn’t work offline to tell me where to go etc. ), and a great one is also Check Out Smart that gives you cashbacks on stuff in supermarkets, sometimes you can get stuff for free. Also register for Cloud, there are plenty places in England where you can catch Cloud wifi.